How should we feel about the creation of various garden styles that are not natural to the site that the garden is being introduced to? First, we have to consider just how the garden type fits into the attendant structures and the site they are on. The applicability or acceptability often has to do with the overall degree that the selected garden style is encompassed by the architectural style. If that style is highly specific, than it will be more difficult to diverge from the architectural ideal. To cite an example, if you have a strongly defined Chinese style of architecture, it would probably be unwise not to follow through with accepted Chinese garden styles for your landscape plan. In this and other similar instances the garden style is or should be used to support the buildings architectural integrity. Where the architectural image is less structured, as is the case with most new European or American buildings, greater flexibility is allowed in the selection of the landscape style. Therein comes the imposition of using a degree of refinement that is defined as the faculty of discerning what is aesthetically excellent or appropriate in whatever style is selected. Attached to that statement however should be a caution that sustainable by virtue of climactic considerations should also be considered in your selection of garden type. Following are many suggestions to assist the designer in the selection of a garden style. As lengthy as this list is, it is not a complete list, as such a selection can only be limited by the imagination of designer’s from around the world. It is also not suggested that the entire landscape needs to conform to a single style and it is quite possible to have one particular style in a section of the garden and another different theme in another. The imposition of excellent taste and creating a feeling of appropriateness in managing these different styles certainly comes into play. Feel free to create your own special garden type or search out others that may not be listed here. Remember that these listings, and the expanded garden theme descriptions, should only serve to inspire you to select the style of gardens that you are interested in. Following a selection, you and your designers should embark on a further detailed study of those particular garden styles. Aerial: If you can observe your gardens from a higher perspective such as a second story or an elevated knoll or escarpment, make sure the bigger picture from there looks attractive and “reads” well. Alfresco Dining: This is a garden activity that takes place outdoor in the fresh air as a place to entertain while dinning or drinking. It must be a place that draws people to this activity in order to be effective. Alpine: High altitude shrubs and flowers, windswept shaped trees; rocks and boulders are the defining features. Annuals: Highly seasonal collection of flowers. Usually set in patterns and/or rows. Typically plants only last one season and then need replacement. Aviary: This is a large environmentally correct enclosure for holding birds in confinement, preferably restricted to birds bred and raised in a caged environment. Axial: Insure that either side of a viewpoint in a garden scene is balanced by a pleasing mix of balance, mass, height and scale, although not necessarily an identical reproduction of elements. Balinese: Essentially tropical in nature, these gardens often have expansive lawn areas and art objects relating to Bali or its people and culture. Birds: A major emphasis on bird nesting features, houses, water and feed stations and lots of natural vegetation producing edible bird seeds, nectar and pollen. Botanical Specific: Make your favorite species of plant the dominant theme for the garden. You can select roses, orchids, iris, alocasia, day lilies, grasses, and many other choices. Add other plantings to support their presence. Butterfly: Butterfly’s are very reliant on specific vegetation to support their larval stages and to feed them nectar and pollen during the mating butterfly stages. Caribbean: Recreate an island atmosphere of your preference from the Caribbean influence on limited sections of your garden or throughout the entire landscape if your climate allows. Chinese: Use typical Chinese horticultural and garden accent selections. Place those icons in appropriate formal, estate, natural, and rural or city gardens. Collecting: Obviously a client can make their favorite plants the collecting item, but there are also non-plant statues, rocks, tiles, fountains & topiaries. No limits except for the avoidance of bad taste. Conservatory/Greenhouse: This is often, but not always an attachment to the house. They usually have large expanses of glass creating a protective growing environment for plants. Container Gardens: This is a fast growing type of gardening. They are often essential elements within terraces and may be your only means of creating satisfying gardens in condominiums. 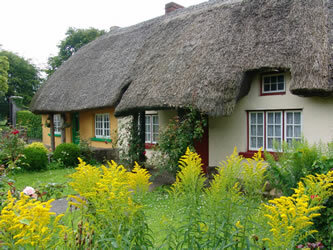 Cottage (small cottage - squire): Often but certainly not always considered a small English style garden with a relaxed landscape style. 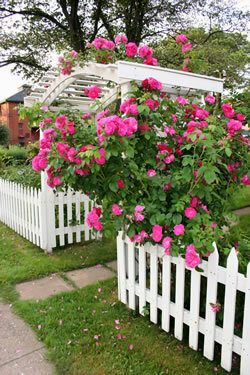 Rambling roses, cutting and herb gardens, and fragrant flowers, small vegetable plots and planted containers. Colonial Williamsburg: Establish boxwood bordered, parterre style kitchen gardens containing flowers, herbs and vegetables scaled to the size of your project. Courtyard: These walled gardens invite close inspection and must be carefully designed. Special paving materials, interesting garden pieces, seating and trained vines all combine to create a readable plan without any confusion. Cultural Specific: These landscape themes may represent gardens from a client’s background that do not fit into the standard descriptions, yet have a specific personality. Cutting: Devote the garden or a large section to flowers and greenery that can be cut and brought indoors for arrangements. Eclectic: Probably the description of most landscapes, a successful eclectic garden combines many forms for well-conceived landscape concepts. Edible: It is a great joy to dine from your gardens, but it takes space and ongoing effort on the part of the homeowner. However, small amounts of fruit, herbs and vegetables can be fun and easy. Educational: This is a most enjoyable way to provide an educational experience to both adults and children alike. These gardens are not just for the public venues. Enabling Garden: A heavy design emphasis on step free and barrier free gardens that encourages the elderly or infirm to enter into and utilize the garden will bring about great benefits for everyone. 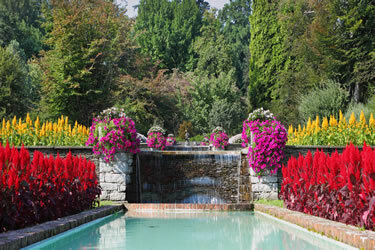 English: Use typical English horticultural and garden accent selections. Place in appropriate formal, estate, natural, cottage or city gardens. Escarpment: This garden style needs a dramatic or at least an interesting change of elevation to make it a viable landscape style. The escarpment theme may derive its impact when viewed from above or seen from its base. Maximize an existing cliff or create one if desired. Estate: Grand is the apt description. As the structure and land expand, the landscape should scale up to fit the estate. Keep the overall design simple, but strong and meaningful. Evergreen: Not just fir or needle plantings, these gardens rely on year round greenery with little or no deciduous material evident throughout the design. Feng Shui: This is a very well known and yet little understood garden style to the general public. Purists of Feng Shui will require a considerably disciplined adherence to design rules, but the amateur can still have success in understanding and using the basic principals of this art form. Fernery: Recreate a forest floor with ferns appropriate to the trees of that forest or fill a conservatory full of ferns of all sizes from miniatures to tree ferns. Forest: Use expanses of properly spaced trees sparsely under planted with appropriate under-story plant material. Attempt to mimic the chosen forest that is being created. Formal/Symmetrical (axial/border): No chaos here. The use of specific geometric forms filled with flowers, herbs, shrubbery or non-plant fills create the image. Use shaped hedges and accent shrubs to identify the pattern or design style. Fragrance: A heavy emphasis on flowers and plant scents describes this garden. Insure that bloom periods extend throughout the year and that only compatible odors interact. French: Use typical French horticultural and garden accent selections. Place in appropriate formal, estate, natural, rural or city gardens. Fruit Tree Gardens (orchards): This edible garden specializes in organizing the trees and/or vines in such a way as to make this very interesting and fruitful garden a pleasure. Garden Rooms: This is a semi-outdoor area attached to the house. 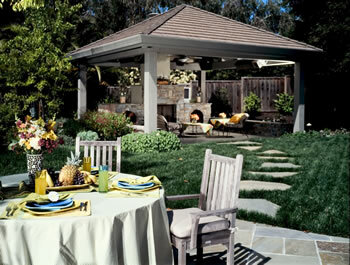 It may be a covered porch or a terrace used to extend an indoor room landscaped with in ground or container planters. Garth: This may be defined as a grassy quadrangle surrounded by cloisters. This design style can be appropriate to a classical approach as well as incorporated in more contemporary landscapes. Geometrical (linear/curvilinear): Although geometric elements are in every garden, a strong dominant emphasis on creating a highly geometric straight line or curved garden outline within the design can add a unique aesthetic to the landscape. German: Use typical German horticultural and garden accent selections. 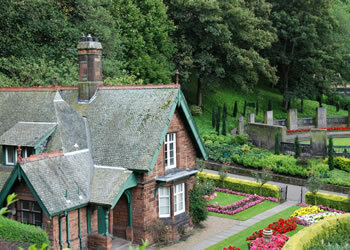 Place in appropriate formal, estate, natural, cottage or city gardens. Grasses: The large variety of ornamental grasses available make this design option very interesting. Grasses provide great contrast, diversity and grace. Gravel Garden: It is unlikely that an entire garden of rocks and pebbles would be very attractive, but a garden with planting accents, where these elements predominate within the design can be quite effective. Greenhouse: These are primarily glass structures that might be attached to a house or stand remote from it and they can house collections of plants for experimentation or protected culture and might even contain an entire planned environment. Habitat: Create a garden that promotes and nurtures any living thing that interests a client, such as plants, birds, fish or other animals. Hawaiian: Create an island garden environment that will inspire luaus, leis and ukuleles by recreating Hawaii and adding its cultural objects within it. Hedged Compartments: This is a garden method used to contain specific use areas such as parterre’s for herbs, vegetable & flowers, as well as privacy or containment such as dog runs, utility enclosures, etc. Herbaceous: This is a plant whose stem does not produce woody, persistent tissue and generally dies back at the end of each growing season thereby encouraging a garden style that will feature those plants usually used for flavoring in food. Hillside: Slopes, boulders and erosion is just some a few of the adversaries on a hillside site. They can dominate the design consideration, but can also result in very unique garden opportunities. Indian: This distinct form of oriental gardening has evolved over eons by accepting various influences, such as those derived from the English, that eventually resulted in a style that was totally their own. Use typical Indian horticultural and garden accent selections. Place in appropriate formal, estate, village, rural or city gardens. Informal: This design form is usually asymmetrical and far more relaxed than a symmetrically formal design. It is often, but not always a more natural design approach for the garden scene. Interior-scapes: As simple as a few indoor plants in containers, or a larger flowering indoor atrium or mall. Shade and controlled temperature tolerance are a major consideration. Italian: Use typical Italian horticultural and garden accent selections. 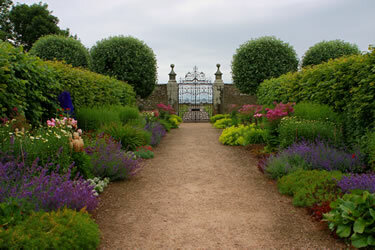 Place those elements in appropriate formal, estate, natural, rural or city gardens. Japanese: Use typical Japanese horticultural and garden accent selections. Place in appropriate formal, estate, natural, country or city gardens. Kitchen Garden: Small garden plots; close to the house can be designed in the most aesthetic manner possible, with the intent of growing and harvesting fruits vegetables and herbs for the kitchen. Land Art: For a dramatic landscape art form, use earthen berms, depressions, rock out- cropping and other elements in dramatic patterns. Then add curvilinear or geometric movement to the combination before planting. Lawns: To achieve the appearance of a disciplined, manicured garden, expanses of grass is hard to beat. Feature it and have the planting support the design. Mediterranean: Use typical Mediterranean horticultural and garden accent selections. Appropriate hardscape features such as colorful tiles, columns, arches and fountains are typical of this style. Memorial: It may be as simple as a small niche in the garden honoring a family pet, to an entire landscape in remembrance of a loved one. A memorial garden can evoke great emotion. 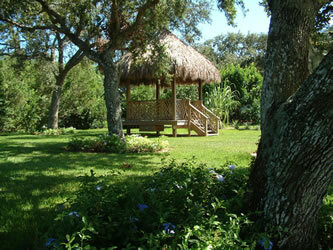 Monastic: This garden style results from the activities of secluded and contemplative inhabitants. The gardens therein are disciplined and supportive of that lifestyle. Moorish: This design style results from a mixing of Arab and Berber cultural influences, primarily in NW Africa. Select horticultural and garden accent pieces and place them in appropriate formal, natural, or city gardens. Native/Natural: Using nature as a guide by using native, naturally occurring indigenous plants from your geographical area. Place them in a natural mass of overhead and under-story canopy that are indigenous in your area and you have a native garden. Nighttime:White flowers and light colored/silver reflective leaves can create a wonderful moonlit garden. Add night scented fragrance and creative landscape lighting to really enjoy your nighttime landscape. Oasis: A fertile or green spot in a desert or arid garden setting usually made so by the presence of water. Quite often the favorite aspect of a garden intended to be desert like. Palm Garden: Pams adapted to your area should predominate. Under-story trees, shrubs and ground covers should share the same cultural environment. Parterre: A garden whose bed outlines form a definitive pattern, usually constructed of plants and containing a flower, foliage, herb or decorative non-plant fills. Perennial Garden: Perennials are usually flowers that last several seasons before mandatory retirement occurs. Evergreen shrubs can form the structure and background for colorful perennials. Persian: Persia was an ancient empire that was comprised modern day Iran and many other kingdoms of southwest Asia. Persian gardens were most likely the forerunner of all modern gardens. Select horticultural and garden accent pieces and place in appropriate formal, estate, rural or city gardens. Photogenic: Gardens may be so complex in design that good photography is impossible. Design can change that by considering scale, composition and light to create a picture taking heaven. Playground (children specific): Equipment must be smooth, splinter free and without sharp edges. Jump and landing spots must be cushioned, with viewing areas open to parents. Errant balls in play must stay out of vehicular areas. Private: Insure whatever degree of privacy the client desires results from an aesthetic manipulation of decorative plantings that has privacy as an intended byproduct rather than an obvious goal. Prairie: A large flat expanse of decorative waving grasses and occasional character trees can offer a very unique design difference. Renaissance: Use typical Renaissance period horticultural and garden accent selections. 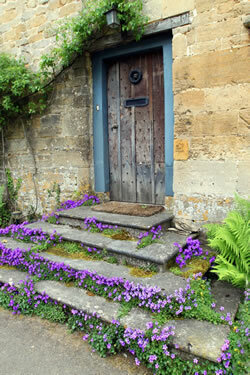 Place those elements in an appropriate formal, estate, natural, rural or city gardens. Rock Garden: Rock garden plants are rugged and beautiful. They naturally look their best when embedded within appropriate rock fields and outcroppings. This is a great solution for a hillside garden. Rooftops/Green Roofs: Visualize a scene from high on the top of a hill and design your rooftop garden with well draining planters and adequate irrigation. Select plants that are drought and wind tolerant. Rose Garden: Everyone knows and loves this garden but not everyone elevates the rose bed and prepares well drained soil. Plan for soaker or other non-overhead watering. Prepare for lots of personal work and enjoyment. Seaside/Coastal: The salt, the wind and the sand are dedicated to battering your plants. Even so seaside gardens can be beautiful. Obtain the best local seaside advice you can. Published books are often too general. Seasons: You move through the seasons and so should your gardens. Plan for this and there will never be a bad landscape season. There should even be spectacular ones. Sculpture: Use sculptures as the centerpieces for the gardens or parts of the garden. These elements draw viewers into the landscape and can hold them there in awe or contemplation. Shade: Shade gardens are every bit as wonderful as sun-drenched gardens. Select plants that are happy to be in the environment long term and use bloom color as an accent rather than the primary element. Spanish: Use typical Spanish horticultural and garden accent selections. 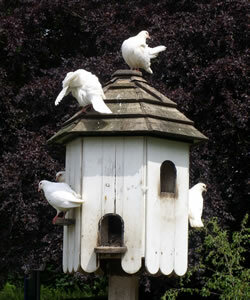 Place them in appropriate formal, estate, natural, rural or city gardens. Sunken Gardens: Don’t worry about depressions in your building site. After drainage considerations and remedial concerns are met, the opportunity to create a dramatic and inspiring garden theme is afforded. Square foot /Allotment Gardens: In this unique garden style, a section of the garden is divided into a series of squares with each square devoted to a specific crop of edible’s or flowers. Terraced Gardens: Create level hillside terraces to provide view potential or just as landscape features on land that might otherwise be wasted in the garden. Thai: Use typical Thailand native horticultural and garden accent selections. Place in an appropriate formal, estate, natural, urban or rural gardens. Topiary: Trimming plants and trees into specific shapes is the primary objective in this garden style. Other plants and non-plant features in the immediate area of the topiaries should be used to support and not compete with the impact of the unique forms. Tropical: Large, colorful and unusual foliage along with an amazing array of big waxy as well as a few small delicate flowers and exotic fragrances make up just some of the very identifiable features in tropical gardens. Water Garden: Waterfalls, watercourses, fountains, ponds, water flowers and fish add sound, action and beauty to your garden. Increase your enjoyment and a homes value with beautiful waterscapes. Whimsical: These are garden styles with a sense of humor. Objects of ridicule, of the absurd, the admired or even the adored can be the style of this garden subset. Wildflower: Large expanses of a variety of flowers that rise up, reseed and rise again in a natural environment can be a great delight. Wildlife Supportive: Wildlife will select a habitat for a variety of reasons, but mostly because there is a water or food source available, followed by a place affording snug refuge or lodging. Winter: Summer gardens also have a winter face. You can plan for it by adding elements that look good all year long and add considerable drama in winter because of snow or their own barren branch characteristics. Xeriscape: This garden design utilizes plantings and planting methods to create gardens that need little or no supplemental watering, feeding or chemical treatments after the initial establishment.